New resource for septic owners and operators, Prop 72 impacts on rainwater catchment system owners, and more! 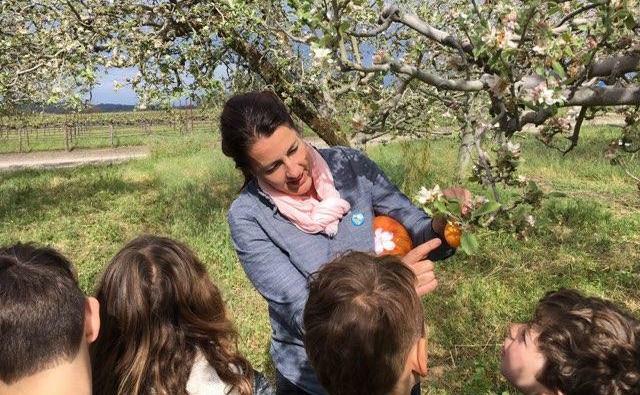 Above: Fourth graders from local schools learn about fruit pollination, apple product processing, orchard ecology and the value of farmland at Dutton Ranch in the TEAM environmental education program . Healthy Soil, Blooming Flowers and Thriving Pollinators! Septic systems, also known as Onsite Wastewater Treatment Systems (OWTS), have been in the news quite a bit lately. In order to combat pathogen pollution concerns, State policies have been updated and County standards for OWTS are being revised. These revisions will change the way OWTS are regulated in Sonoma County, and you may be wondering how the changes will affect you. While the regulations are still evolving, neighborhoods and communities in the lower Russian River area will be affected in the not-too-distant future. In the meantime, making sense of all the laws, manuals and acronyms is no easy task – and for the many residents who depend on OWTS, it can be hard to know where to start. To that end, there is now a resource that is dedicated to providing communities with resources and support regarding the OWTS issue. In June, California voters have a chance to vote to exempt rainwater catchment systems from new property tax assessments. Proposition 72 would add rainwater systems to a list of property improvements that are excluded from the calculation of a parcel’s value. This list already includes earthquake safety upgrades and solar energy systems, among others. Removing the tax burden has made adopting home upgrades such as these easier for the landowner. 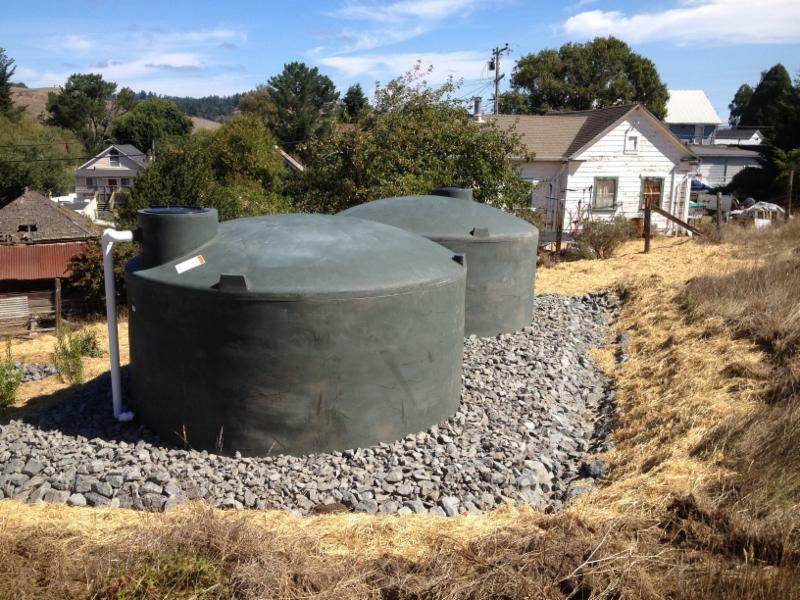 When the Gold Ridge RCD started building rainwater catchment systems almost a decade ago, the question often came up from our participating landowners: If I partner with the RCD to build a rainwater system, will it cause my property taxes to increase? This is an excellent question, and one that RCD staff and our partners had not thought about a lot at the time, so focused were we on the resource benefits of these projects. Currently, many improvements to property (including some rainwater systems) require a building permit, and the County Assessor’s office uses permit filings to determine the value of these improvements. That value is then used as the basis for increasing the property tax amount to reflect the increased value brought by the improvement. Since a rainwater system can be considered an improvement to a property, there was a natural concern on the part of our program participants that their taxes would rise. 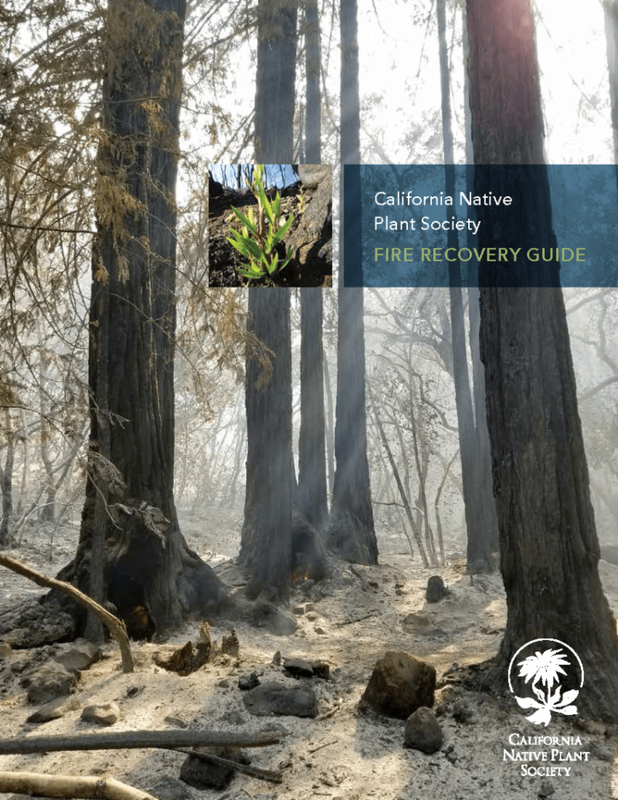 Much of California has a Mediterranean climate – a rainy winter and a very dry summer – where the dry season corresponds with the growing season. During the winter, water demand is low, but during the summer it’s much higher, because in hot weather people consume more water, crops and gardens need to be irrigated, pools are filled, etc. This sets up an ideal situation for rainwater catchment: if you can capture water when it’s abundant and store it to be used when it’s scarce, you can reduce the summer stress on water supplies and on the wildlife and ecosystems that depend on flowing rivers and streams to make it through the long dry summer. In a time of more frequent and severe droughts, and with climate change presenting an uncertain future for our state, this type of creative solution is vital in addressing the limitations of our water supplies, as well as the impacts of our water use on the natural world. Planting hedgerows for pollinators couldn’t be timelier as we celebrate National Pollinator Week June 18-24th, an annual week-long educational tribute to pollinators hosted by the U.S Fish & Wildlife Service. Hedgerows provide multiple benefits to both farmers and wildlife. Installing a diverse assemblage of vegetation in your hedgerow that blooms year-round offers important pollinators like bees, hummingbirds, bats, beetles, butterflies and flies with a continuous food source of nectar and pollen. Whether you’re a ranch owner, dairy producer, winegrape grower or have a small scale orchard or row crop farm, property edges are everywhere. 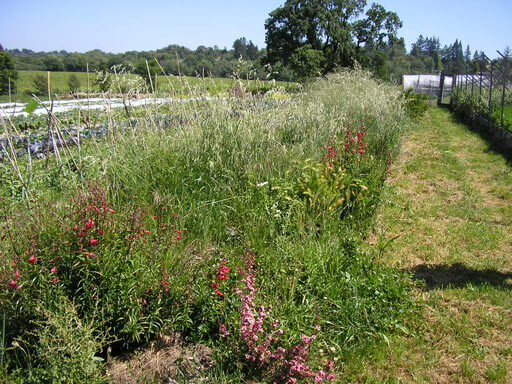 Boundaries between crops or property lines should not be undervalued or underutilized, but rather seen as an opportunity to enhance pollination, biodiversity, or soil health. Bringing these edges back to life can greatly benefit your operation from a natural resource perspective as well as increase beneficial habitat. 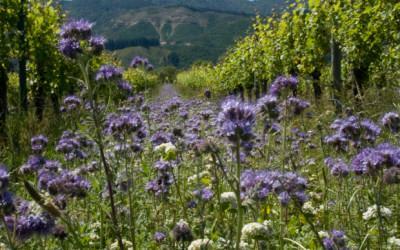 Since grapes are self-pollinating plants, vineyard owners may be less concerned about attracting pollinators; however, these individuals can support healthy cover crop production. The Gay’s Sonoma County ranches (one on Bay Hill Road and another on Freestone Ranch Road) have legacy erosion issues that pose a management challenge that the Gays have taken head on. Jon and Misty have set their vision on stewarding the ranch for soil health, wildlife habitat and excellent grass for their cattle. To meet this goal, the owners and their management team work actively to protect the ranch’s waterways from continued erosion, enhance and preserve existing wildlife corridors and graze the cattle using the holistic management approach. The Gays recently completed a Carbon Farm Plan with the help of the Gold Ridge RCD for the Bay Hill Ranch. Carbon Farm Plans identify practices that would allow agricultural operations to increase carbon sequestration and reduce greenhouse gas emissions. Carbon farming involves an array of strategies that promote long-term carbon sequestration by capturing carbon in the soil and plant material. Many carbon farming practices also improve a farm’s resilience to climate change impacts. Taken together, they promote soil health and productivity, and improve water holding capacity, crop and forage production, and wildlife habitat. As a result of the planning process, the Gays are beginning designs of riparian and semi-marshland plantings. Learn more about the Gay’s restoration ranching techniques here and view an aerial tour of the waterways here . We hope you’ll meet these folks! 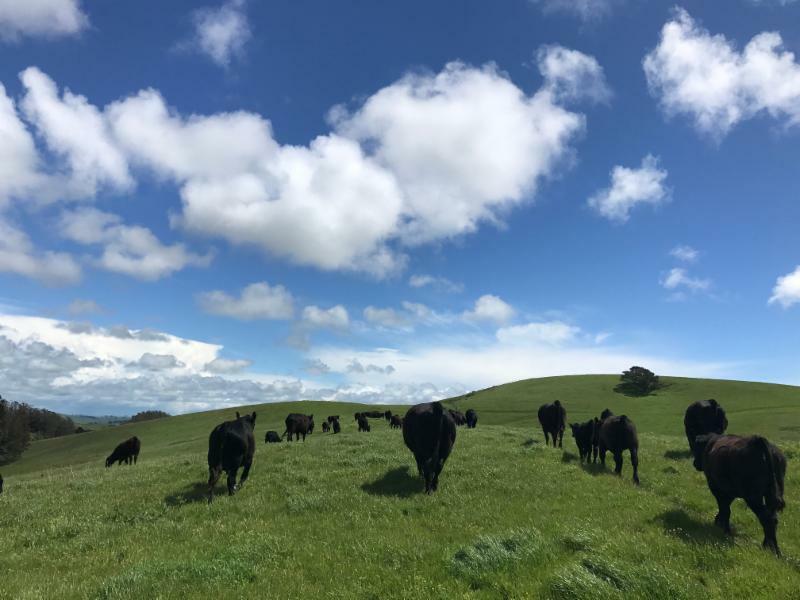 The management team will be hosting four opportunities this June to see the beautiful Freestone Ranch, get to know the ranchers, meet the cows and buy their supremely delicious holistically-grown beef. June 5 & 19: Ranch “Ramble,” 6pm to sunset, 750 Freestone Ranch Road, Bodega, CA 94922. Join Grazing Manager Ariel Greenwood to experience the ranch, explore pond and riparian life, ID grasses, and follow our curiosities. This is a casual but intimate way to get to know the land and animals you help us steward, and watch the cows graze at sunset. Beef boxes will be available for sale as well. June 23: Ranch Harvest Celebration with Live Music by MaMuse! 1pm - 4pm, 750 Freestone Ranch Road, Bodega, CA 94922. RSVP her e . Celebrate the fun and beauty of summer on the ranch with a BBQ. $15 Arrive at 1 pm for the beef tasting. We will tour the ranch with music at 2 pm. Bring your cooler if you are inspired to take home a cut or two of meat from our freezers. June 26: Bay Hill Ranch Watershed Walk, 4pm-6pm, Bay Hill Road, Bodega Bay, CA 94972. RSVP here . Visit the Bay Hill Ranch, see what coastal erosion into Bodega Bay looks like and what we are doing to make our watershed healthier. Beef sale will be happening at all events. Special sale this month: $4.25/lb hanging weight for quarters (reg. $5.50/lb). You can also purchase beef in store at Andy’s Produce Market or Bill’s Farm Basket in Sebastopol, CA, or online here . 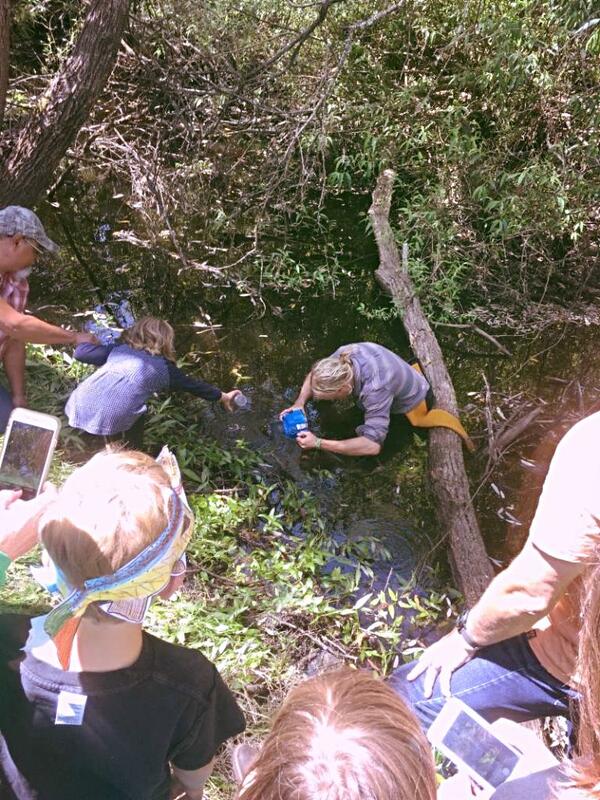 On a beautiful, late spring day, students from McNear Elementary School in Petaluma donned their homemade paper steelhead trout hats as they hiked down to Atascadero Creek for a special ocassion. Their teacher, Dana Morelini, worked with Regional Park and Trout Unlimited staff to coordinate the release of twenty or more young steelhead trout her students raised from eggs through the Steelhead in the Classroom (a program of the Sonoma County Water Agency). The small fish (about the size of your finger) were gently transferred from the cool water of an insulated, aerated bucket to the wild waters of Atascadero Creek where it runs through Ragle Ranch Regional Park in Sebastopol. The Steelhead in the Classroom program is an important program that teaches conservation of our wild fish neighbors. 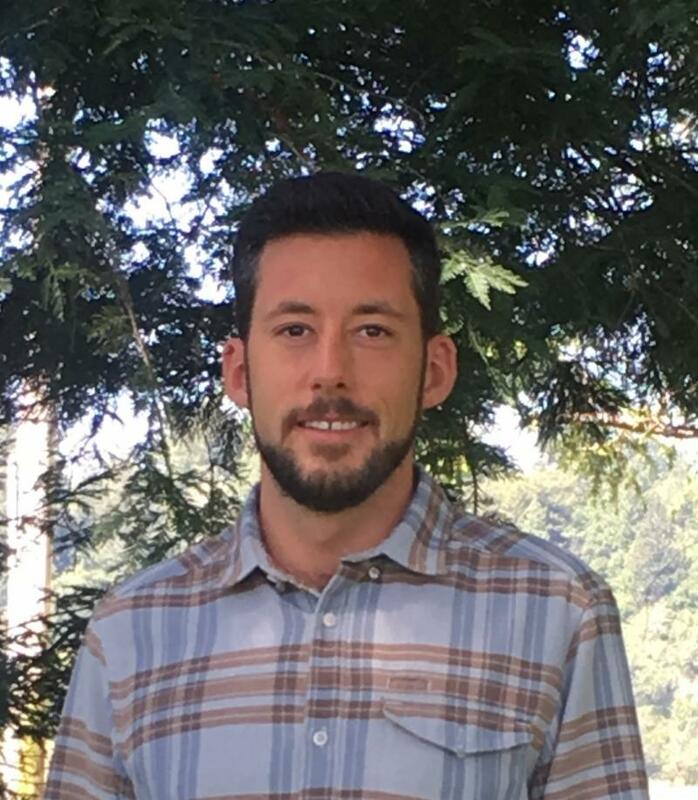 The program has students experience first-hand the value of aquatic environments, the balance that must be met to maintain and preserve California's fisheries and aquatic habitats, and how their personal actions affect these valuable resources. Keep an eye out for the young fish when you next walk Ragle Ranch Regional Park! Freestone Ranch , June 5 & 19, 6pm, See article above for details. Freestone Ranch Harvest Celebration & Live Music from MaMuse! Freestone Ranch , June 23, 1pm-4pm, See article above for details. Freestone Ranch , June 26, 4pm-6pm, See article above for details.